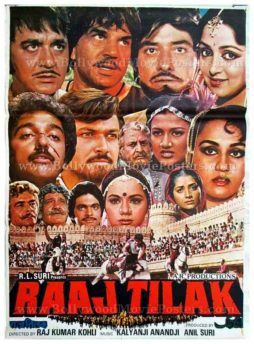 Old Bollywood movie poster of the multi starrer Hindi film, Raaj Tilak (1984) for sale. This is an actual surviving vintage poster of the 1984 film that featured an impressive star cast comprising some of the leading actors of the time. In total, photographs of 14 stars are seen on this poster, making it one of the rare posters of its kind to feature so many faces in one single sheet movie poster! Printed and circulated a few years after the release of the film, this old movie poster was originally designed for publicity of the film but never ended up being used. The typography used in this poster is entirely in English except for a translation of the title on the bottom left. A still photo from a gladiator styled action scene is seen at the bottom of the poster. 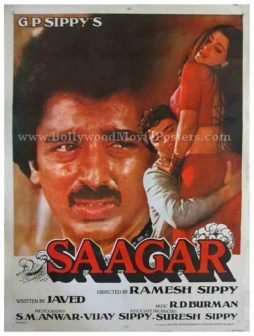 Raaj Tilak is a 1984 Hindi film with a highly impressive star cast that included actors such as Kamal Hassan, Raaj Kumar, Sunil Dutt, Dharmendra, Hema Malini, Ranjeeta Kaur, Reena Roy, Yogeeta Bali, Sarika, Pran, Ranjeet, Raj Kiran and Ajit. A period action film, Raaj Tilak was directed by mutli starrer specialist Rajkumar Kohli and was declared a success at the box office.